Former first minister Alex Salmond is in talks to take his sell-out Edinburgh Fringe show on tour, it has been revealed. The politician, who was ousted from Westminster in June’s snap general election, took to the stage with a series of special guests in his show Alex Salmond... Unleashed. He added: “The show has been a tremendous success and we have welcomed a host of amazing guests to the Fringe stage, raising money for good causes far and wide. “I have thoroughly enjoyed my time treading the boards at the Festival and I relished being Alex Salmond... Unleashed for 19 shows in a row. 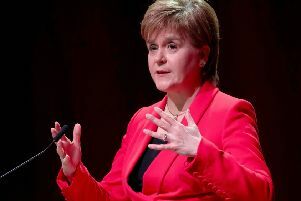 Guests on Mr Salmond’s show over its run included politicians such as Brexit Secretary David Davis, as well as the former Celtic footballer Neil Lennon and comedian John Bishop. The last show featured Scottish Brexit Minister Mike Russell as well as a surprise appearance by singer Sheena Wellington, who performed the Robert Burns classic A Man’s A Man For A’ That, which she sang at the opening of the Scottish Parliament in 1999. Tasmina Ahmed-Sheikh, the former SNP MP who produced the show, confirmed talks were taking place with a view to taking it on the road. She said: “This has been a fantastic production all round and the city of Edinburgh has been a great host.